Today I was asking the question, From which former Soviet Union republic is it most difficult to find mail? In the 1990s, several of the ex-Soviet republics experienced some disorganisation at some point and mail - internal or external - becomes very scarce. I think this is true for Georgia in the early 1990s for example. 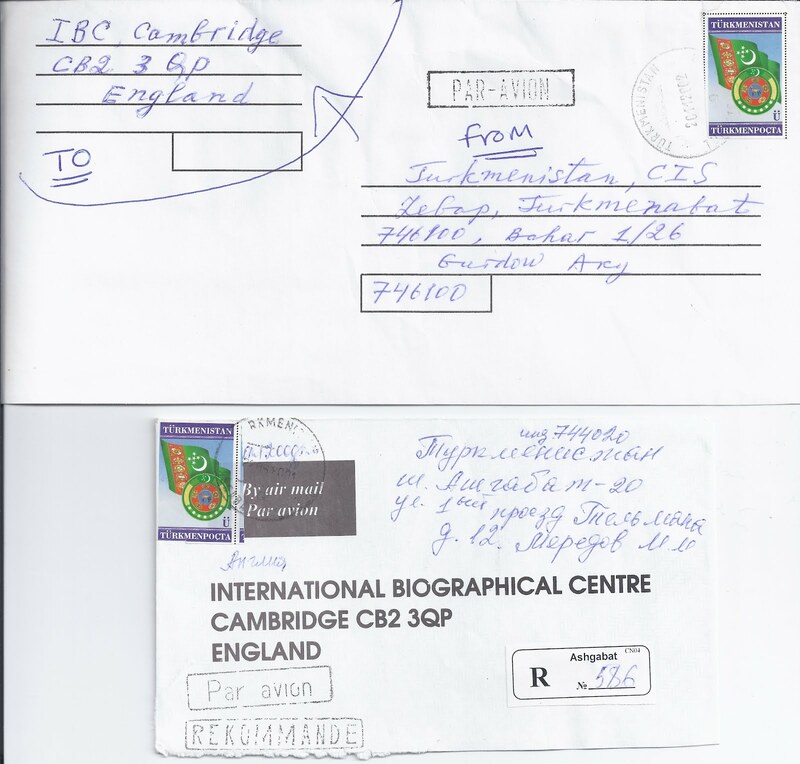 But over the ten year period from 1991 to 2001, my guess is that mail from Turkmenistan (internal or external) is the most difficult to find. Maybe this is only true for someone living in Western Europe - perhaps there is lots of Turkmen mail going East and I haven't seen it. 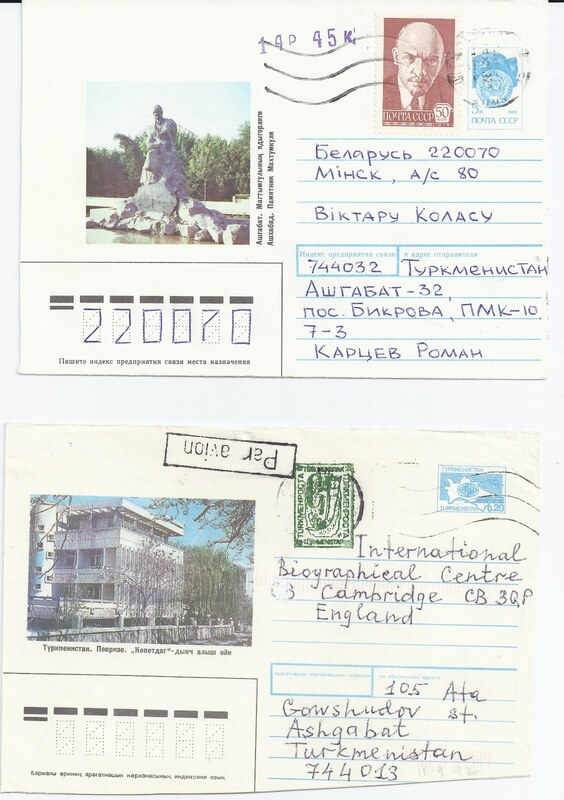 Anyway, I have only about 20 items of mail from the 1991 - 2001 period, all going out of the country and only two or three items from a place other than Ashgabat - one is shown at the top of this page. The country has issued very few stamps compared to the other ex-Soviet republics. At first, there was a philatelic agency involved which protected its New Issue revenues by issuing stamps locally in a damaged state (see my previous Turkmenistan Blog for an example). Later stamp issues were often simple in design and imperforate - I show a couple of examples above. 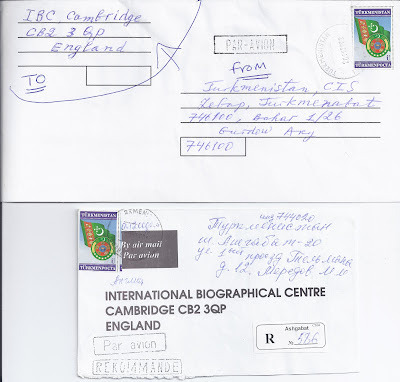 There have also been postal stationery revaluations which I am sure are interesting. I can only show two examples above. If I recall correctly I have a couple similar. Feel free to add this to your blog - you'll certainly have chance to do so before I get round to doing anything on my FSU webpages!